Adam Wainwright didn’t waste any time in greeting the press this afternoon. “It’s great to see you again,” Waino said as the room full of moving pens and recording devices laughed which made the staff ace ask what was so funny. This is Waino as a person in any environment. Certain players let the burn of the stage overwhelm them. Waino is the opposite. When asked right off the bat about coming back so quick after the World Series, he wanted more action. Waino had a heavy workload in 2013 and that can always leads to questions about his health going into 2014. What did he do to balance the load? Waino didn’t hesitate when asked about whether Clayton Kershaw’s record setting contract made him have pause about signing for 6 years and 97.5 million last year? Many people raved about Michael Wacha’s season, but Waino made it a point to mention the role of Shelby Miller in his first full season. 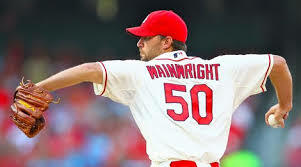 Adam was impressed about Wacha’s quick impact but was hesitant to throw too much pressure on the kid. All in all, Waino was cordial with the media and met up to his high reputation held around the league as a true leader. He looks a little bigger than last season as part of the team has put together a new fitness regime. At the end of the day, Waino expects the Cards to be back there gunning for the World Series again and isn’t thinking about last year too much. Since he is the staff ace and new leader of the club, he doesn’t have time to live in the past. Come back later for insights on Trevor Rosenthal, Kevin Siegrist, as well as Jhonny Peralta’s first press session. Dan Buffa is the co-creator, administrator and writer for the movie website, film-addict.com. He also contributes to United Cardinal Bloggers, Arch City Sports, Aaron Miles Fastball, Voicesfilm.com and writes for his personal blog,www.doseofbuffa.com. He is also a published writer for the Yahoo Contributor Network. Dan is a St. Louis, Missouri born and raised writer with a need to inform and the ability to pound out 1,000-1,500 word pieces with ease. When he isn’t writing or drinking coffee, he is spending time with his wife and son in South City. Follow him at @buffa82 on Twitter and reach him for thoughts, comments and general feedback at buffa82@gmail.com. This entry was posted in 2014 Cardinals and tagged Adam Wainwright, stlcards, winter warmup by danbuffa82. Bookmark the permalink.